Actually, in my house, whenever we see a super creepy guy dressed like a super creepy guy on TV, one of us says, "That guy's gonna be wearing someone's face around later." And it's all because of this episode. You have to admit, it's pretty distracting. That happens sometimes, with baddies. They (or their actions) can be so evil, so memorable, so ostentatious, that they eclipse the actual story. The great, personal story in Se7en is totally overshadowed by Gweneth Paltrow's head in a box. I'm not saying that makes it a bad movie. I'm just saying it happens. Anyway, this episode isn't actually about a Vidiian surgeon wearing Crewman Daniel's face around like a Halloween mask. It's about B'Elanna Torres' longtime personal struggle. It's about her identity issues suddenly becoming a very real, physical problem that she has to overcome in order to survive. Re-watching this one it occurred to me that Both Dawson and the writers have a spectacular handle on the character of B'Elanna. Dawson plays each side differently than she plays regular B'Elanna. Klingon B'Elanna's voice is deeper and her speech more aggressive while Human B'Elanna's voice is lighter and gentler and she's more reserved overall. Everything about these characters is just a little different from the way B'Elanna is usually played. From posture to voice to eye contact, each of the three versions of B'Elanna are different and unique. Back to the story: The idea of a klingon/human woman being at odds with herself goes back to Susie Plackson's character, K'Ehleyr, on TNG. The idea of a human/alien bi-species character having issues with his/her identity in Star Trek goes all the way back to Spock. But no character has before been physically split. And, I kind of get why. It sounds a bit goofy--a little like venturing into "Spock's Brain" territory. It helps, though, that we never see the procedure. Actually, the way we're brought into the knowledge of B'Elanna's split is really well-engineered. We're first shown Klingon B'Elanna. We're lead to assume that the Vidians have simply done away with B'Elanna's human DNA. We spend a lot of time with Klingon B'Elanna and we get used to her--her aggression, her strength, her confidence. They're all qualities our B'Elanna possesses, just not quite in such abundance. It's not until the end of Act 1 that we get a glimpse of Human B'Elanna. We soon recognize more qualities we're familiar with: sensitivity, self-doubt, and a brilliant, technical mind. B'Elanna has always been at war with herself but, in these incredibly dangerous circumstances, both sides have to work together to survive and thrive. And, really, that's what B'Elanna does every day. In the end, she doesn't really want to be melded back into her true self but, like it or not, this is who she is. Each half of B'Elanna makes the whole stronger. -I love that a Talaxian makes a guest appearance here. 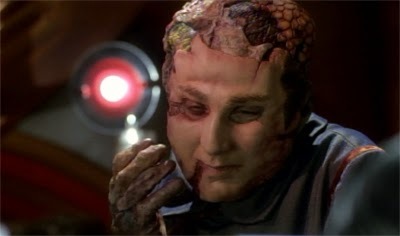 -When Chakotay says, "My face was just grafted." I almost lose it. Every time. I love it. -I adore Klingon B'Elanna's forehead ridges. -I love the moment where each B'Elanna sees the other--up to this point they both believed they were all that was left and this reveal is a great one.